One day after work, I showed a fingerless mitt I was working on to a couple of coworkers. One of them asked drolly, “How do you know which hand the mitt goes on?” I was of course thinking that it’s worn so that the design is on the back of your hand. 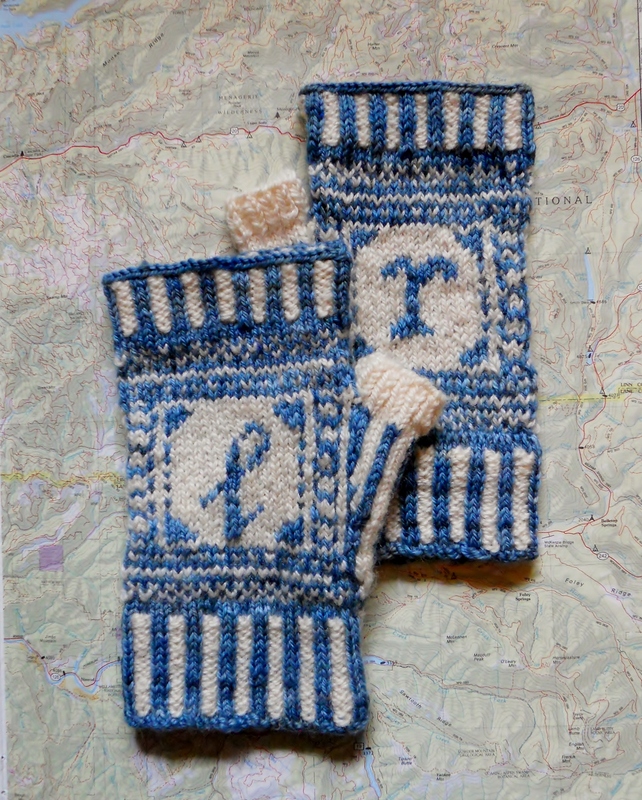 His next question: “Why don’t they put left and right on mittens so you know which hand to wear them on?” Immediately I wondered whether there existed any patterns indicating left and right. Racing home, I went right to Ravelry and looked at the existing patterns. There may have been just one children’s pattern with left- and right-hand labels at that time. I was so surprised that there weren’t more! This design is the result of that discussion. Pattern is specifically charted so that motif is centered on back of hand and charts are included for both upper and lower case L and R. Turn your hands over, and the arrows on the palms point appropriately to the right or to the left.